UNITED NATIONS, June 25 -- In the run-up to US President Obama's climate change speech today, Inner City Press from the UN participated in an embargoed background briefing by self-described Senior Administration Officials. They fielded questions from the largest of media about the Keystone pipeline and the role of EPA. But UN officials were already gushing, before the call, during the embargo, as if they knew what would be announced. Olav Kjorven, for example, tweeted on Sunday, the day before the call, that “Obama will announce regulation of CO2 from existing power plants on Tuesday.” But when he was asked, by the Free UN Coalition for Access, for an estimate of the carbon impact of his own travel, he did not respond. The UN, when asked the same with regard to Ban Ki-moon, did at least respond, with a Note to Correspondents. But that said they don't keep track, of Ban in particular. Inner City Press: there is something called Greening the Blue, I have tried to ask them directly and haven’t received a response, whether the UN’s Office of the Secretary-General estimates the carbon footprint, the carbon effects, of his travel, which obviously is quite necessary, but can you disclose what that the quantity is and whether it is in any way offset? Deputy Spokesperson Eduardo Del Buey: Well, we’ll try and get that information for you, Matthew. We do not have specific estimate of the Secretary-General’s travel, but we do estimate regularly the United Nations staff’s total carbon footprint as well as the share of air travel. According to the most recent Greening the Blue report, launched on 19 June 2013, the total emissions of 8,185 staff members at the United Nations Headquarters estimate 63,059 tonnes (CO2eq), of which 48 per cent is caused by air travel. On the question of Ban's travel impact, the UN did not have or provide an answer. But on the question of air travel, ironically, the same week Ban's Department of Public Information was tweeting about its multimedia partnership with the airline Royal Air Maroc, see here with model plane. In the new offices, at least for the press, lights go on automatically even if one does not want them. 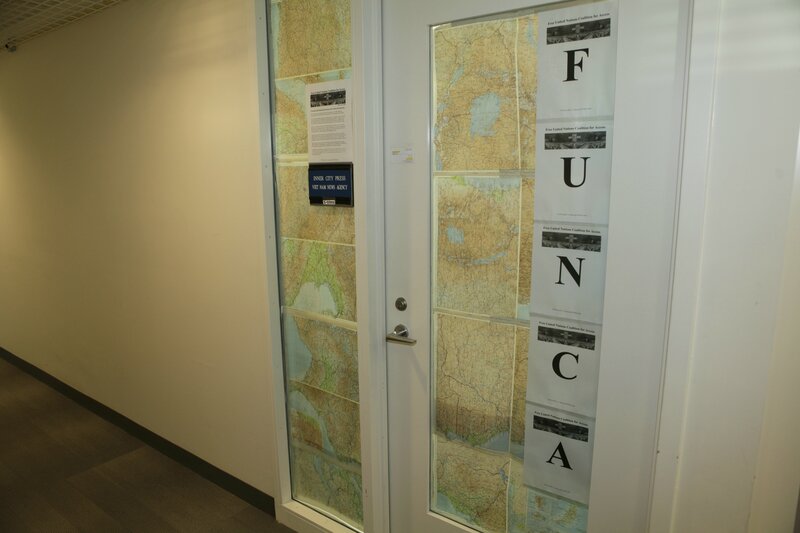 Meanwhile DPI has devoted a lot of energy to trying to order Inner City Press to take a simple Free UN Coalition for Access sign off the door to its office, while allowing the old UN Correspondents Association to have two prominent signs, a big meeting room, a separate office and even a locked UNCA pantry in which it stores its wine glasses. 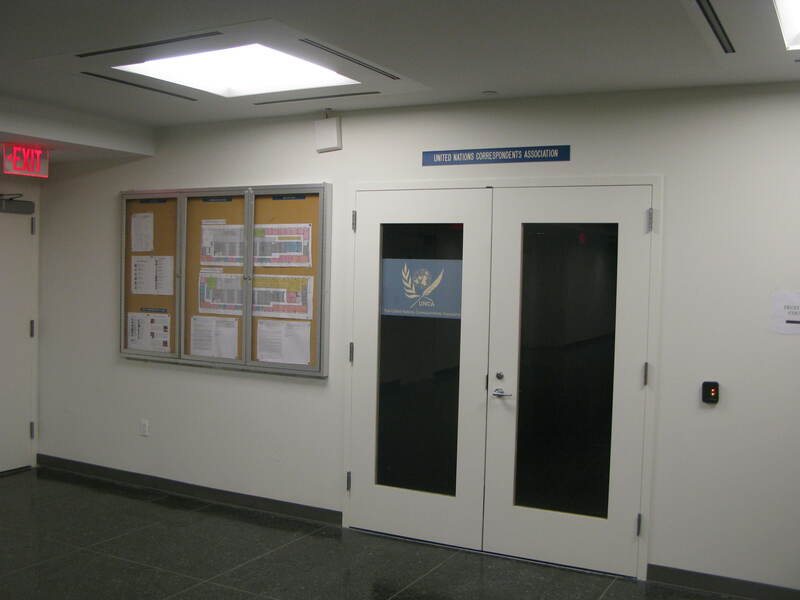 Likewise, the UN Censorship Alliance announced limitations of use of the UN Security Council stakeout as media workspace, which is how new media coverage of the Council is possible, conversing with diplomats going in and out while writing a series of short pieces about a range of topics. The US takes over the Security Council presidency on July 1. What will they do about it?